Golf bags can, and will, get a bit untidy. You stuff extra gloves, scorecard, pencils, tees, snacks, a cap, a water bottle or whatever else in there. The most important item of course is extra golf balls. When you inevitably lose a ball you end up scratching around in your bag to find a new ball. Usually there are a couple of different brands in there and some are new and some are a bit scuffed up. 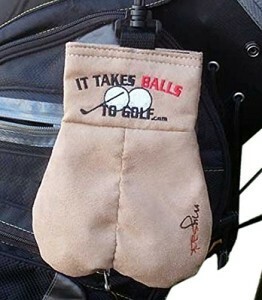 With the MySack golf ball storage sack you can keep at least two of your favourite backup balls close at hand. Some users have even fit as many as 8 balls into it with the Velcro still closing securely. Of course, it is also guaranteed to get more than a few laughs out of other players! Sometimes the bathroom is the only place in the house that offers a bit of peace and quiet. No wonder some guys stay in there for as long as possible. I usually have a stack of my favourite magazines at hand, but I’d love a gift like this. Something a little more “active” to do while you take care of your business. Granted the construction quality is not outstanding, but for only $10, you can’t expect much more. It’s still a great funny golf gift and will guarantee to get some laughs and keep the men entertained at your next barbeque. 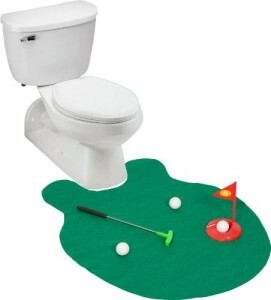 Buy the EZ Drinker Toilet Golf Putter Practice here! Fair warning: this one is not for the faint hearted or strait-laced golfer. Golf is considered a gentleman’s game and a certain amount of decorum is expected of participants. If the golfer in your life is not averse to a bit of foul language and was rolling on the floor watching the infamous TED movie, this funny golf gift will give him lots of entertainment. It says five R-rated phrases from the movie, and will be sure to get some laughs on the course. Just make sure to keep it away from young children. 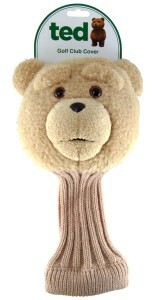 Buy the Ted Talking Golf Club Cover here! If you are stuck for a stocking filler or a gift at the annual office party, this funny golf gift will do nicely and get a ton of laughs. 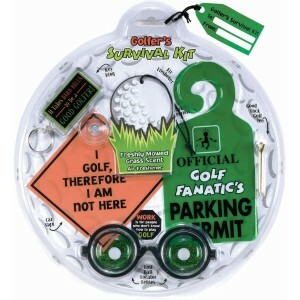 The pack includes: a key chain “It takes hard balls to be a good golfer!”; Freshly moved grass scent air freshener; Official golf fanatics parking permit; a good luck golf tee car sign “I golf, therefore I am not here; and lost ball locator lenses. Most of it won’t ever get used, but will draw more than a few laughs around the house or office. Buy the Golfer’s Survival Kit here! This is the perfect gift for any single — or married — man. The appropriately named “Nudie Tee” is a golf tee and divot repair tool made in every man’s favorite shape. The Nudie Tees not only look great, but are also useful! They are made from a strong, unbreakable plastic that can get smashed by your woods over and over. It also includes a free golf accessories bag and two black golf balls. Available for less than $20, this is one of the best funny golf gifts available! Buy the Nudies Tees 10-pack here! These should give you ample ideas for your next golf gift. You may be planning something more substantial like a new driver, but lighten things up even more and add some funny golf gifts just to see their reaction. 1 Pings/Trackbacks for "Five Funny Golf Gifts"
Get FREE updates and deal alerts! What are the Best Golf Clubs for Seniors? What are the Best Irons for Beginners? What are the Best Golf Tees? What's the Best Golf Swing Trainer? Like us on Facebook for the latest updates and great golf deals! Subscribe for FREE! Get updates and great golf deals!